Lactadherin / MFG-E8 - Haematologic Technologies, Inc.
Lactadherin (MFG-E8) binds, Ca++-independently, to phosphatidyl-L-serine via the C2 domain and binds the avb3 and avb5 integrins via the second EGF domain. The one letter amino acid codes refer to identified amino acids that participate in binding. For the C2 domain the capital letters refer to water-exposed hydrophobic residues. Lactadherin is a widely distributed glycoprotein (~ 50 kDa), which was originally characterized due to its association with milk fat/lipid globule membranes. Synonymous names are PAS-6/7, bovine-associated mucoprotein, BA-46, P47, and MFG-E8. Structural hallmarks of lactadherin are the presence of two epidermal growth factor (EGF) homology domains (with an RGD peptide motif in the second EGF domain), and two C domains sharing homology with the discoidin family of lectin domains including the phospholipid-binding domains of blood clotting factors V and VIII. Lactadherin shows preferential binding to phosphatidylserine (L-form) in a calcium independent manner, and binds more specifically than Annexin V.
Purified lactadherin functions as an anticoagulant by blocking phosphatidylserine-containing membrane sites for blood coagulation proteins (10). Fluoresence-labeled lactadherin functions as a sensitive probe for exposed phosphatidylserine on nucleated cells and on stimulated platelets (8, 9) . Lactadherin will bind to membranes that have phosphatidylserine content below the threshold for annexin V binding. Lactadherin is purified from un-pasteurized bovine milk (11). 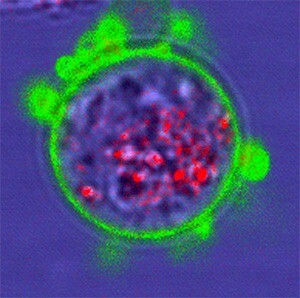 Above: K562 cells (top) and HL60 cells (bottom) co-stained with both FITC-conjugated lactadherin (green) and Alexa-647 conjugated annexin V (red) early in apoptosis. The annexin is internalized in granules and is not detectably staining the cells. Reference: Shi, J., Y. Shi, L. N. Waehrens, J. T. Rasmussen, C. W. Heegaard and G. E. Gilbert (2006). "Lactadherin detects early phosphatidylserine exposure on immortalized leukemia cells undergoing programmed cell death." Cytometry A 69(12): 1193-201. Copyright 2006. John Wiley & Sons, Inc. Reprinted with permission of John Wiley & Sons, Inc. Above: HeLa cells stained with FITC-conjugated lactadherin 2 hours (top) and 3 hours (bottom) after treatment with staurosporine. Early in apoptosis the cells have small vesicles and long, thin appendages that stain avidly for lactadherin. Reference: Waehrens LN, Heeghaard, CW, Gilbert GE, Rasmussen JT. Bovine Lactadherin as a Calcium-independent Imaging Agent of Phosphatidylserine Expressed on the Surface of Apoptotic HeLa Cells 2009 J. Histochem. Cytochem. (ePub June 2009). 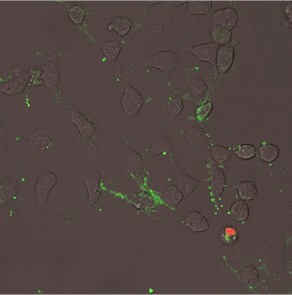 Above: Phosphatidylserine exposure in mouse mesenteric venous thrombosis. Mice were given 1 µg each of lactadherin and annexin V by tail vein immediately prior to externalization of the mesentery. The mesentary was exposed to ferric chloride and then the animals were perfused with saline/paraformaldehyde. Serial sections of the mesentary were stained with anti-fibrinogen/fibrin (left), anti-platelet (middle), and anti-lactadherin antibodies (right) developed with the alkaline phosphatase Vector Red substrate. A layer of fibrinogen/fibrin (left, closed arrows) overlaid a mural hemorrhage (open star). Platelets (middle) were scattered along the luminal surface of the thrombus (open triangles) as well as upon fibrinogen/fibrin strands extending into the lumen. Lactadherin staining (right) was strongest along the raised endothelium surface (closed arrow), including adherent platelets close to the wall. Platelets on fibrin strands did not stain detectably (open arrow). (Shi J, Pipe SW, Rasmussen JT, Heegaard CW, Gilbert GE. Lactadherin blocks thrombosis and hemostasis in vivo: correlation with platelet phosphatidylserine exposure. J Thromb Haemost. Jul 2008;6(7):1167-1174). Physiologic function as opsonin or bridge ligand (6, 7) . The lectin-like domains engage phosphatidyl-L-serine, the second EGF domain engages avb3 and/or avb5 integrin leading to phagocytosis of apoptotic cells. Butler, J.E., Pringnitz, D.J., Martens, C.L., and Crouch, N. 1980. Bovine-associated mucoprotein: I. Distribution among adult and fetal bovine tissues and body fluids. Differentiation 17:31-40. Hanayama, R., Tanaka, M., Miwa, K., Shinohara, A., Iwamatsu, A., and Nagata, S. 2002. 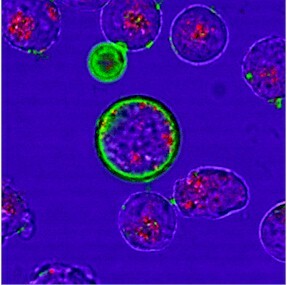 Identification of a factor that links apoptotic cells to phagocytes. Nature 417:182-187. Haggqvist, B., Naslund, J., Sletten, K., Westermark, G.T., Mucchiano, G., Tjernberg, L.O., Nordstedt, C., Engstrom, U., and Westermark, P. 1999. Medin: an integral fragment of aortic smooth muscle cell-produced lactadherin forms the most common human amyloid. Proc Natl Acad Sci U S A 96:8669-8674. Silvestre, J.S., Thery, C., Hamard, G., Boddaert, J., Aguilar, B., Delcayre, A., Houbron, C., Tamarat, R., Blanc-Brude, O., Heeneman, S., et al. 2005. Lactadherin promotes VEGF-dependent neovascularization. Nat Med 11:499-506. Ceriani, R.L., Sasaki, M., Sussman, H., Wara, W.M., and Blank, E.W. 1982. Circulating human mammary epithelial antigens in breast cancer. Proc Natl Acad Sci U S A 79:5420-5424. Hanayama, R., Tanaka, M., Miyasaka, K., Aozasa, K., Koike, M., Uchiyama, Y., and Nagata, S. 2004. Autoimmune disease and impaired uptake of apoptotic cells in MFG-E8-deficient mice. Science 304:1147-1150. Hanayama, R., and Nagata, S. 2005. Impaired involution of mammary glands in the absence of milk fat globule EGF factor 8. Proc Natl Acad Sci U S A 102:16886-16891. Shi, J., Shi, Y., Waehrens, L.N., Rasmussen, J.T., Heegaard, C.W., and Gilbert, G.E. 2006. Lactadherin detects early phosphatidylserine exposure on immortalized leukemia cells undergoing programmed cell death. Cytometry A 69:1193-1201. Dasgupta, S.K., Guchhait, P., and Thiagarajan, P. 2006. Lactadherin binding and phosphatidylserine expression on cell surface-comparison with annexin A5. Transl Res 148:19-25. Shi, J., and Gilbert, G.E. 2003. Lactadherin inhibits enzyme complexes of blood coagulation by competing for phospholipid binding sites. Blood 101:2628-2636. Hvarregaard et al., 1996. Eur. J. Biochem. 240. 1. Akakura S, Singh S, Spataro M, Akakura R, Kim JI, Albert ML, et al. The opsonin MFG-E8 is a ligand for the alphavbeta5 integrin and triggers DOCK180-dependent Rac1 activation for the phagocytosis of apoptotic cells. Exp Cell Res. 2004 Jan 15;292(2):403-16. PubMed PMID: 14697347. 2. Baghdadi M, Chiba S, Yamashina T, Yoshiyama H, Jinushi M. MFG-E8 regulates the immunogenic potential of dendritic cells primed with necrotic cell-mediated inflammatory signals. PLoS One. 2012;7(6):e39607. PubMed PMID: 22761839. Pubmed Central PMCID: 3382463. 3. Cui T, Miksa M, Wu R, Komura H, Zhou M, Dong W, et al. MFG-E8 Attenuates Acute Lung Injury in Mice after Intestinal Ischemia and Reperfusion. Am J Respir Crit Care Med. 2009 Nov 5. PubMed PMID: 19892861. 4. Hanayama R, Tanaka M, Miyasaka K, Aozasa K, Koike M, Uchiyama Y, et al. Autoimmune disease and impaired uptake of apoptotic cells in MFG-E8-deficient mice. Science. 2004 May 21;304(5674):1147-50. PubMed PMID: 15155946. 5. Jinushi M, Nakazaki Y, Dougan M, Carrasco DR, Mihm M, Dranoff G. MFG-E8-mediated uptake of apoptotic cells by APCs links the pro- and antiinflammatory activities of GM-CSF. J Clin Invest. 2007 Jul;117(7):1902-13. PubMed PMID: 17557120. 6. Mobarrez, F. et al. Microparticles in the blood of patients with systemic lupus erythematosus (SLE): phenotypic characterization and clinical associations. Sci. Rep. 6, 36025; doi: 10.1038/srep36025 (2016). 7. Rothmeier, A. et al. Caspase-1–mediated pathway promotes generation of thromboinflammatory microparticles. J Clin Invest. 2015 Apr 1; 125(4): 1471–1484.